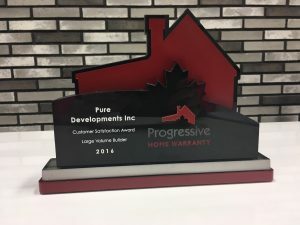 Pure Developments is proud to announce that we have received the Customer Satisfaction Award for the third year in a row. This years award was in the Large Volume Builder category. Thank you to our clients and the sponsor of this award- Progressive Home Warranty, as this award is determined by the consumer. Thanks again to everyone who supported us in 2016 and throughout the years of our business!